The RSCM (Ruby Source Code Management) gem provides a nice interface to SVN, CVS, ClearCase, StarTeam, etc. 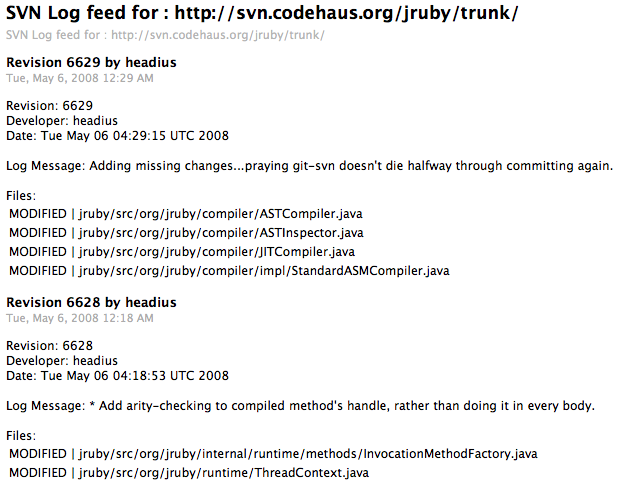 and since it's written in pure Ruby, it runs just fine on the JVM. Then download this file. Not much to it, 106 lines and 45 of that is the template for creating the rss xml doc. -p, --port=3003 Which port do you want the server to listen on. -h, --help Show help (this). Nice, think I'll actually use this. Seriously, though, without a doubt Ruby is very expressive and makes nice, tight source files; combined with JRuby you're going to get great performance too. FYI: if you use Hudson for continuous integration, it's already got RSS feeds for change logs. Hudson's RSS feeds are for builds, not change logs. If you keep things in your repository (like artwork repositories, or things like that) that don't trigger a build, you won't get notified that way. Additionally, you won't get a notification for each checkin, you'll get a notification for each build. Depending on the frequency of your SCM polling in Hudson you will potentially get one build for multiple checkins. Additionally, if your build is time-scheduled rather than check-in scheduled, it won't really keep you informed about checkins so much as keeping you informed about builds. Admittedly, this is splitting hairs. In the majority of cases, knowing what built and what went into it is what you want, and Hudson's RSS feeds are great for this. But if you need to truly monitor activity in the repository for audit reasons or to help document what problem employees have been doing, Hudson's RSS feeds don't really cut it.